Before diving into technical and architectural details, I need to first cover some basics. I hope this initial review cuts through any lurking confusion on basic BPM terminology, methods, and modeling approach. A Task is a modeling element, from the BPMN/CMMN notation, representing a unit of work. The task also provides a container metaphor and classification for a group of one or more services (human and system) dedicated, from a valued output perspective, towards the completion of a dependent business process. The process model (from BPMN) defines the context and placement, via the task’s value-add dependency. Including the term “activity” in our definition. A process-oriented activity is an abstract type and implies work performed within a process. This “work” refers to one or more assigned tasks. An activity also implies responsibility and participation. Though the terms “task” and “activity” are often used synonymously they are not the same. A task is a unit of work (atomic) – an activity is work performed and includes one or more tasks. In context to business functional decomposition, most analysts turn to Porter’s value-chain methodology (consciously or not). This approach provides the mental tools generally required to form initial abstractions. These abstractions illustrate the relationships between functional tasks necessary for the transformation of resource and effort into viable product. However, with a focus on “business function” we’re guided towards seeking out the necessary means towards production – as in the immediate visualization of an assembly line. I’m thinking of a conveyor belt moving along various work-stations. Each station contributing effort and resources into the product’s construction. The problem though with functional decomposition, in context to value-chain analysis, is that it implies the application of effort and resources along an abstract production line. Read left to right (see below illustration), we end up with a model lacking the concept of human and systems collaboration outside the line. The fact is that a value-chain model, as its name implies, communicates the need for focused effort whereby each worker dedicates their attention within their station’s boundaries. The value-chain abstracts a production-line. A production-line defined by the role its attached workers/systems play (functionally) during the creation of commercial goods and services. Key point is that resources flow through the production line (value-chain instance). The value-chain methodology breaks down when attempting to model contemporary commercial services. Concepts like “information worker” and collaboration lack notation. Consequently, value-chain analysis falls short of fully conceptualizing (and thereby utilizing) the complete picture of modern commerce, capability, and potential. Now visualize a modern business office… there is no assembly line. The relationships between workers is both virtual and dynamic. People and systems collaborate as needed to get the job done. And, this network of collaboration isn’t bolted to the floor – the flow of materials takes a path defined by each worker’s skill and availability. They collaborate: ability, skills, and knowledge are shared as often as they are applied towards commercial genesis. We now require BPM, as a methodology, to fill in the details of contemporary complex human and systems interactions. In BPM, the Task works as a container who’s definition is abstract. Meaning that we only know what gets done as a result of its instantiation. The worker is distilled out of the task’s definition so that he or she is then later assigned via the process model. The process model joins worker (participant), via their role, to the Task. The process then aligns skills/capability to requirements (skills/worker to Task) via their participation within the process instance. Given that a BPM Task only represent units of work (i.e. what gets done and not how it’s done), we now have a concept to help organize our thoughts around information technology and its relationship to people and automation (agents). People require technology as apposed to the Task itself. The Task doesn’t define a point-solution (application). Instead, we build the technical tools required by our information-workers. These tools are then applied, as needed, based on role and participation. This approach contrasts with the value-chain methodology whereby a worker’s function is defined by their assigned station. It’s important is to understand the differences between these methodologies and their contribution. 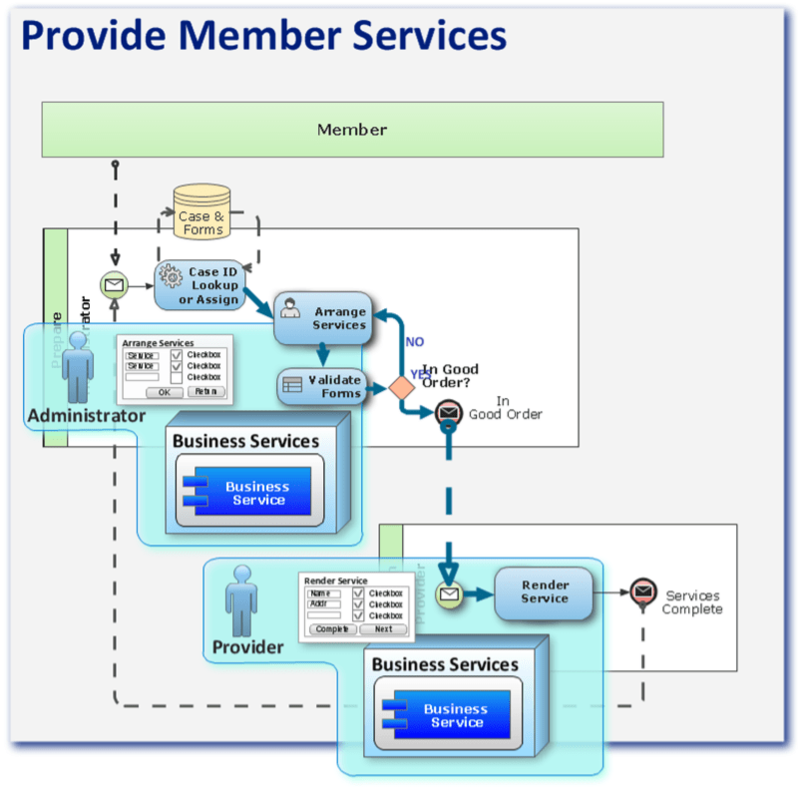 Porter’s Value-chain doesn’t necessarily contradict BPM’s effort. These two perspectives are complimentary as long as their boundaries and analysis are both clearly understood and reasonably applied. So, we’ll compare each with an approach towards a mixed application – each doing its part, as a methodology, towards delivering a complete solution. Representing a value-add perspective of business activities within the organization’s networked, or linked, operations (Porter 1985). Activities are discrete economic functions or processes, such as managing a supply chain, operating a sales force, developing products, or delivering them to the customer. An activity is usually a mix of people, technology, fixed assets, sometimes working capital, and various types of information (Magretta 2013). This model representing a value-add perspective of business activities within the organization’s networked, or linked, operations. Extending Porter’s model we apply the service-oriented construct in representing our activity as a single or orchestrated collection of technical services. In this model, business value is represented as managed system capabilities whereby, “each value chain is a use case of the services it uses” (Commins 2010). 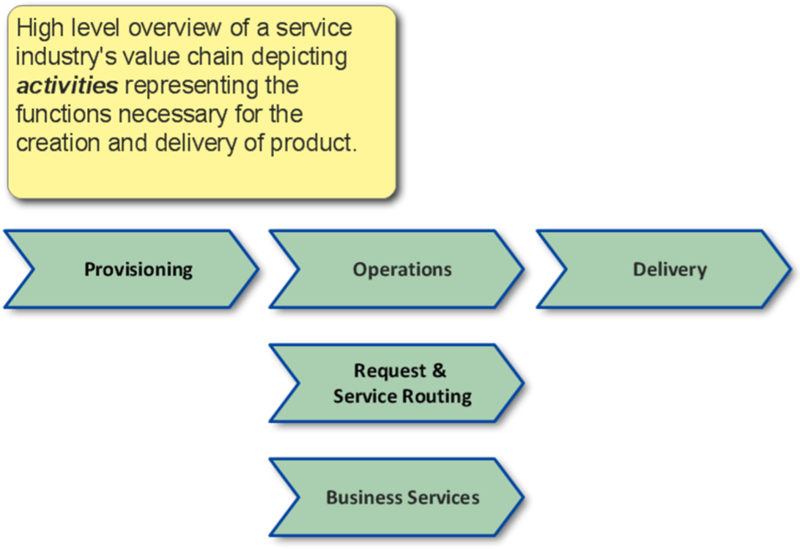 The operations business activity (value-chain function) includes “process management” because, as a service, it plays a supporting role in its defining use case. In contrast to Porter’s Activity, as linked operations, a BPM Task (or BPM Activity) has its focus on measured work-output as value received from either genesis or state change within represented business objects. Porter’s Activity doesn’t necessarily include Worker/Task participation whereas this relationship is vital to our BPM Task implementation. In context to a BPM process model, a Task’s work output is measured as the value received. The necessary effort required to produce this value marks the task’s beginning and end. And, given need for quality and efficiency alongside speed, our scope includes any resources the participant requires to complete this task. Work output is measured as the value received from either the genesis or state change in business objects. In this model we combine Task, Process, and Service models into a holistic view representing our process-oriented architecture. Web-UI and Business Services are identified and aligned to task and process requirements. Our goal being the development of loosely coupled service components across applications. 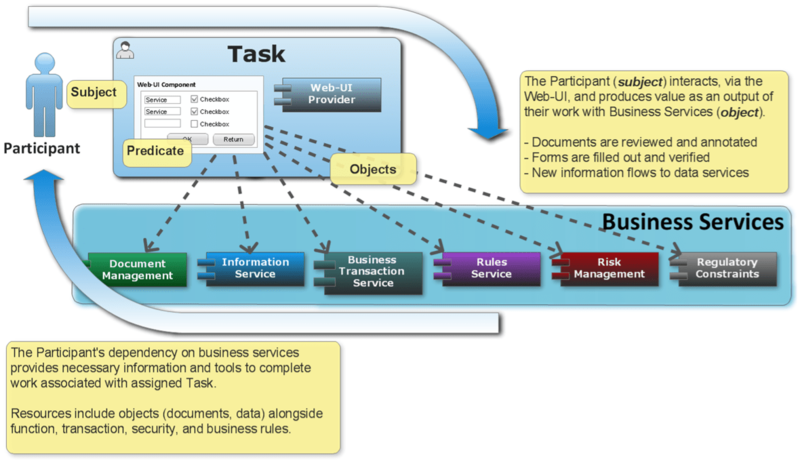 Web-UI and Business Services identified and aligned to task and process requirements. Cummins, Fred A. 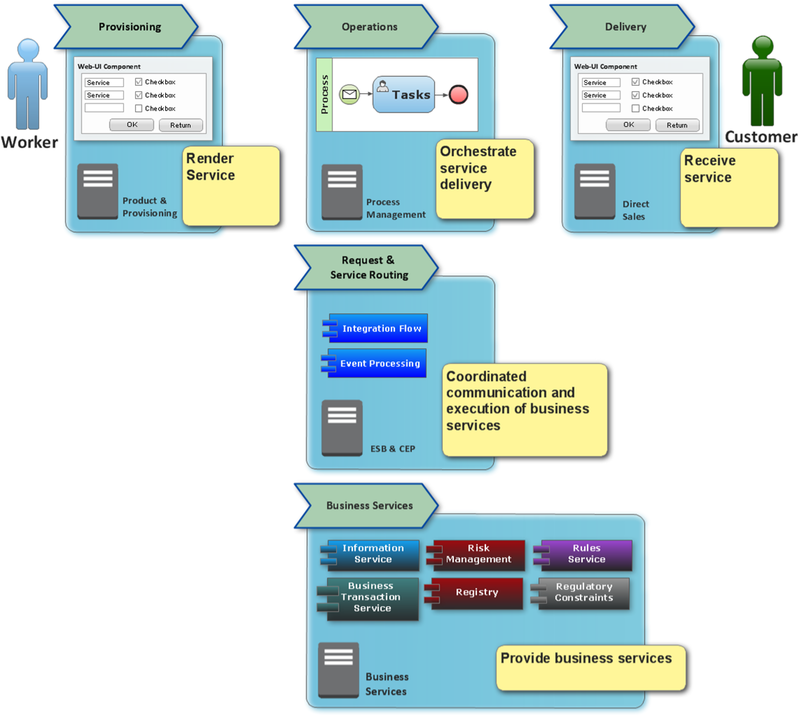 (2010) Building the agile enterprise: with SOA, BPM and MBM. Morgan Kaufmann.